Oh mercy me! Perhaps 2 and 3/4 years is when they decide to ramp it up and test even more boundaries than what they were trying on at 2 and a half years. The level of intense ferocity due to one of many "dilemmas" in his life can go from zero to 100 percent within 0.25 seconds, and the noises that one little human can make at a certain pitch has you wondering whether dogs in the neighbourhood hear his call. But you know what? 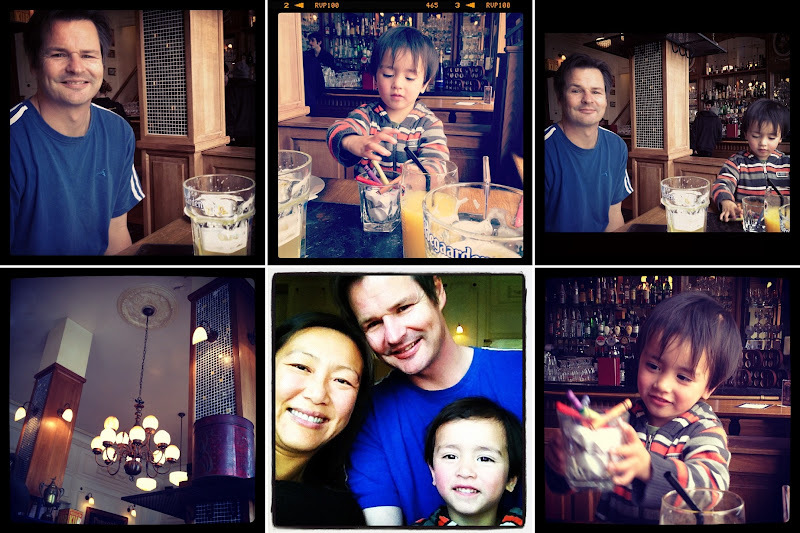 When things are good they are great, and last Sunday we had some fun times in the city. We headed toward North Wharf on foot, passing through Victoria Park. We decided to have a late lunch on Princes Wharf, and chose Limon. 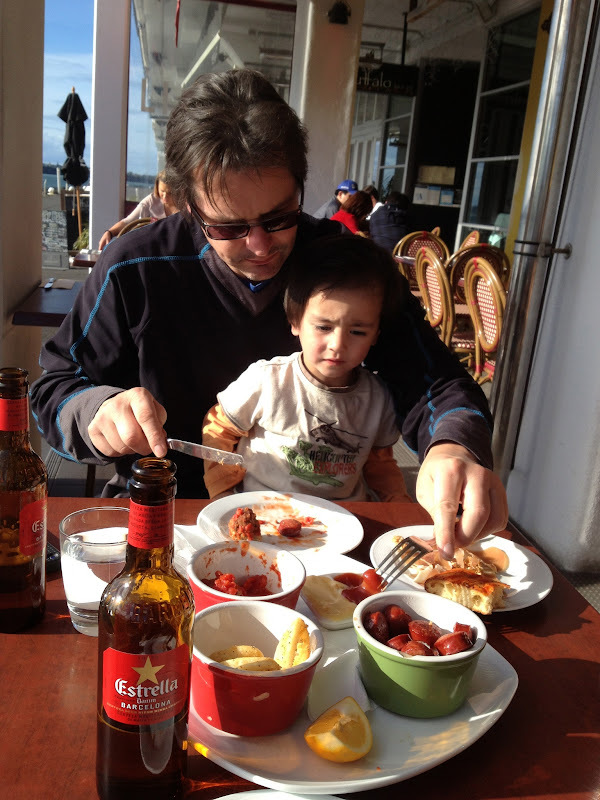 We sat in the sun drinking imported Spanish beers and enjoyed some wonderful tapas. Kien decided he was going to run back and forth from the edge of the dock to our table. This was a tremendously fun game. When lunch was over we walked further down the wharf where the boys lowered the camera to record what was under the water. Neither Jef nor I have looked at the videos that were recorded yet so I can't tell you if there are any fish. But there are mussels, I can tell you that much. 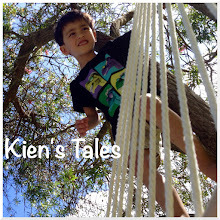 It was nice to see Kien enjoying himself. We then made our way back toward Wynyard Quarter as the sun was slowly setting. Jef and Kien had fun running up and down the astroturf mound. 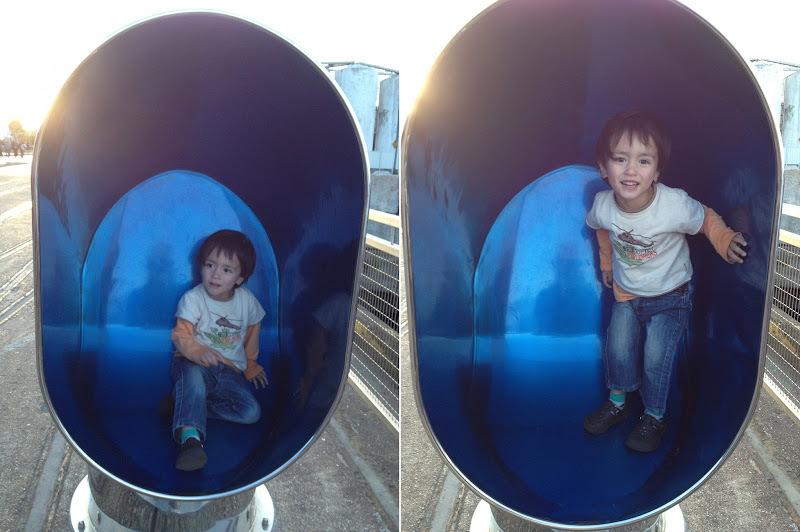 We then made a quick stop at the playground before it got too dark. Such a fun afternoon in the sun. 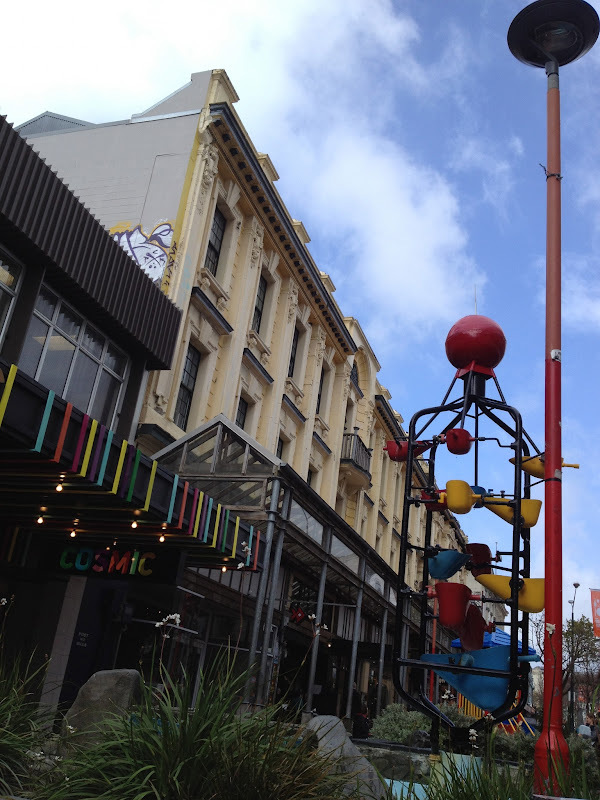 Auckland is an awesome place to live; it is no wonder Lonely Planet rated this place as #1 and #2 in the travel guide. "Kien, I'll get you blueberries and strawberries for breakfast." "NO, I DON'T WANT BLUEBERRIES OR STRAWBERRIES FOR BREAKFAST!" "Mummy, can I please have blueberries, please?" "Shall I get you some strawberries too?" "OK. I go sit down on my chair." "Kien, we are going to visit Mummy's friend. I bet you'll have lots of fun." "NO, I DON'T WANT TO SEE MUMMY'S FRIEND. I WANT TO GO HOME!" "I WANT THE CAT TO COME INSIDE". "I WANT THE CAT TO GO OUTSIDE". "WHERE'S THE CAT? I WANT THE CAT TO COME INSIDE". "Hey boys, I think the cat needs to be left alone for a bit. I don't think the cat wants to play anymore." "I need to fix the transmitter. I need a screw driver." "Hey Kien, why don't you put all your screws and bits you take off into a container so we don't lose anything?" "Kien, can I please have a smile?" "MUMMY! Mummy please lie down with me, please? Mummy please stay?" "I'll stay for just a little bit, OK? Move over." He rolls over, I crawl into bed, and little arms are wrapped around my neck and I feel soft lips press against my cheek. The only photos I took this weekend were these, and I have been hesitant to take them off the SD card to post only because it was such a sad ending to our time at the park. We've been waiting for a wind free moment of opportunity to take the freshly built RC plane for it's virgin flight. In between the rain on Sunday afternoon there was a break in the weather and a relatively calm and sunny spot. So we seized the moment and went to the park to fly the craft. Both Kien and Jef were rather excited, a) to get out of the house, and b) to fly the plane that has been hanging in the bedroom for over a week. The plane flew really well. See that giant tree in the background? The plane spent a night in the top branches. A few people at the park, including ourselves, spent ages yesterday trying to get the plane down, to no avail. It was stuck - well and truly stuck - and I was so sad at the prospect of $300 worth of plane and radio gear stuck in a tree that I couldn't bring myself to take a photo of the sad sight. What's more, I was close to ditching all the above photos too. But hark, good news. After weathering the storm and shifting position during the day Jef was able to lasso the branch it moved to, and the plane came down with a bit of shaking. Woohoo, recovered plane, which means woohoo, Kien no longer has to keep saying "Daddy's plane is stuck in a tree" over and over again. You know how painful that is when it's still stuck? The boys spent a bit of the evening fixing the broken bits, which were actually few and far between. So a happy ending after all. Although the title of this post may sound like I've been a lazy mummy who can't get her a into g to dress her child, I swear this is not the case - although I must admit it was really nice not having to dress him this morning (change of nappy being the exception). He slept through the night last night too, so we started off on the right note this morning. I'm still not 100% well, and now just happen to have lost my voice as well, so I'm squeaking my way through this week. We had a pyjamas and pancakes day at playgroup this morning. I helped make the pancakes, but Kien was constantly asking me to go outside to play with him. He was very patient when I told him I had to do this and I'd come out after everyone had eaten. He ate one bite of a pancake, had a few slices of banana, and was tucking into the rest of the fruit on his plate when someone plonked a container of blueberries on the table. With his favourite food on the table there was no way he was eating anything else. I think he may have consumed half that container of blueberries. Finally I went outside and played with him. Here's a little montage of him outside this morning. He's a real chatterbox, as you'll see, and he's also getting to an age where he is actually playing and interacting with other kids. It rained on and off all day so I decided to stay home for the rest of the day. My neighbour Diane gave me some fish that came all the way from Kiribati - her daughter's boyfriend is from there and the fish (a whole chilly bin full) were a gift from him. I baked them for dinner tonight (with Kien's help peeling the garlic). I'm bracing myself for another hard day in the office tomorrow. It's going to continue being this busy until we deliver this project at the end of October. I just need to make sure I'm pacing myself and not take the whole thing too seriously otherwise I'll drive myself mad as a result of my over zealous perfectionist tendencies. I've had a lovely camomile tea, and I'm off to bed now. Goodnight.